If we're being real, Lawnya Vawnya got its real start upstairs at the Rocket Room during a screening of Play Your Gender, a new doc featuring musician Kinnie Starr that examines the realities of women in the music biz. 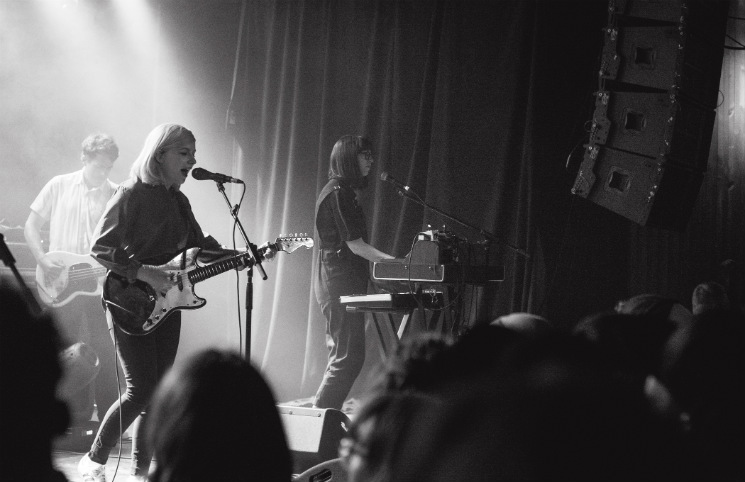 But almost directly after, Alvvays took the stage at Club One just down the way, awash in fuzzy oranges, greens and blues as they delivered their similarly fuzzy and colourful jangle-ocalyptic tunes. Singer Molly Rankin couldn't hide her love for the rowdy St. John's crowd (Why would she?) and wore an ear-to-ear grin for much of the set, blasting through songs from their self-titled album and the more recent Antisocialites. In between there was a tale or two, including one that could've doomed the show: just before "Plimsoll Punks," Rankin mentioned her and bassist Brian Murphy almost slipped off the Sugarloaf Path into the deep blue sea. She also sounded under the spell of the island: "Is it Wednesday? Is it Thursday? I don't know. It doesn't really matter, does it? Time is subjective." For the moment, the crowd of Newfoundlanders who might have felt the show in the morning agreed whole-heartedly. There were quite a few sing-alongs during the set, but none as loud as during certified smash "Archie, Marry Me," which was buoyed oh so jubilantly by a kid in a Slayer hoodie pogoing by himself, raising up one hand to the sky as if in blissful worship.